Inside the Gherkin – On top of the World? Last week I had the unexpected chance to get myself inside one of London’s most iconic buildings: 30 St Mary Axe, Headquarter of Swiss Re, also known as the ‘Gherkin’. Built by Norman Foster at the turn of the century using parametric design and thus a novel technological approach, this building has seen both praise (for instance by winning the Stirling Prize in 2004) and criticism (for instance in the recent Channel 4 Programme ‘The Secret Life of Buildings’ for its lack of consideration of the users’ workplaces). As I said, chance has led me to my visit. It involved a conference a couple of years ago, a book that was now published by the conference organisers and sent to my old address, which I no longer lived at. The new tenant googled for me, luckily found my university profile and emailed me how I’d like to get hold of my book. 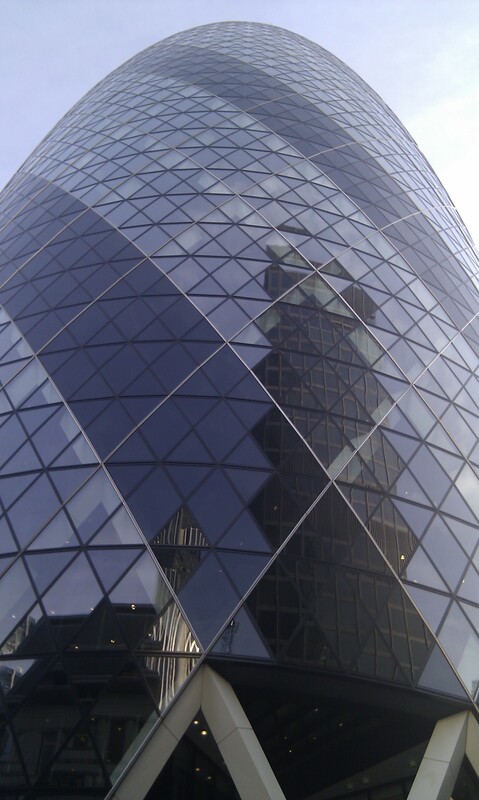 He offered to take it to his workplace for me to pick up – and hey, it was the Gherkin. So there I went, quite excited I have to admit. Approaching the building I already felt small and quite out of place. Why had I thought of putting on a jeans this morning? Everyone else entering the building was in suits. Black suits. White shirts. Ties. City workers’ uniforms. At reception they knew I was coming. I received a visitor’s pass, went through the airport-style security and found myself facing several blocks of lifts. One of the lifts had just arrived, so I jumped in, realising too late that it would only go up to the 12th floor – I had to meet the guy with my book on the 28th. On the 12th floor I got off, walked to another block of lifts, got inside and rode up as far as this one would take me – 22nd floor. Got off again, walked over to yet another set of lifts and this time it took me to the 28th. So I reported to reception, took a seat and decided to take in the view later, after my brief meeting. When the guy came, we shook hands, he gave me the book, we had a brief chat, and just as I was about to leave, I mentioned that I’d be hanging on a little while to enjoy the view – being an architect and never having been to the Gherkin before. And this is how he offered to take me up to the top floor and the cafe there, so I could properly have a look at London from above. What a wonderful opportunity! Only staff working in the building are allowed to use the cafe, but the waiters there were obviously quite used to people coming up without consuming anything, and instead just standing there, gazing downwards on the metropolis below them. It was a beautiful day with heavenly blue skies. And what a view it was! The Thames folding its way through the city, everything so small down below us. Distances didn’t seem to matter – Waterloo station looked as close as the City Hall, or the Tower of London, or the London Eye, or the Shard rising up to the skies on the other side of the river. It was breathtaking and I wished for a short moment that I would work here, too, just to come up with my laptop from time to time and work from there. Upon inquiry my host admitted that it was indeed mainly the view that made working in the Gherkin special, although he said he also didn’t find anything wrong with his workspace, despite the criticism in ‘The Secret Life of Buildings’. So are the underwriters of SwissRe and the lawyers and accountants and whoever else works in the Gherkin gods that have powers of understanding the city, while we, the ordinary masses down below are blindingly ruled by them? I don’t think our modern life is that easy and although bashing bankers and the likes has become increasingly popular, I believe that we are all blind in certain situations, and in others, we can see with clarity what others cannot see. I do have a good deal of sympathy with the Occupy Wallstreet movement and their criticism of the world of finance, I have to say, but still I believe the best and most interesting viewpoints come from a detailed and close investigative look from the inside of the financial world, as for instance explored and wonderfully described by the Dutch anthropologist Joris Luyendijk for the Guardian. So it seems to me that rather knowledge is power, definitely more so than working in a specific profession, or in a specific building.